It's GiveBig! 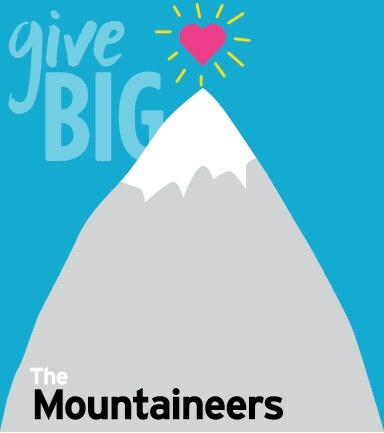 Make sure to give with The Mountaineers! As our 110 year history has proven, we’re not going anywhere and we have more work to do! In 2016, we are committed to further expanding diverse voices in the outdoors by growing our Mountain Workshops program to engage even more at-risk and LGBTQ youth. We also plan to double up our conservation efforts by providing our adult and youth members with more opportunities to engage in environmental stewardship and advocacy. In addition, we will continue to support the growth of our volunteer program, allowing us to offer more courses and engage more members in outdoor activities. Your generous donation through GiveBIG will allow us to reach more youth and engage diverse voices, expand our conservation work, and continue to support, grow and deliver on our mission in the Pacific Northwest and beyond.